Super Savings Item! 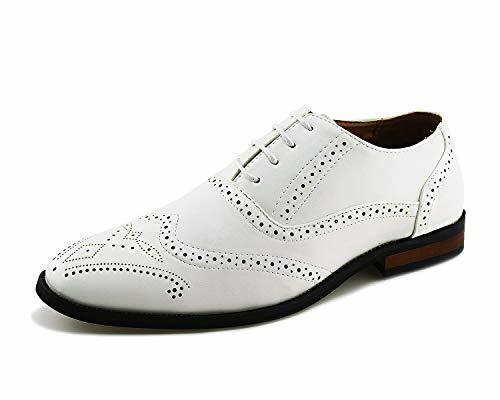 Save 38% on the Jabasic Men Oxford Dress Shoes Casual Classic Lace Up Wingtip Shoes (12,White) by Jabasic at SCRHI. Hurry! Limited time offer. Offer valid only while supplies last. Cap-Toe Oxford Shoes Made Of Synthetic Leather,Breathable And Comfortable. Men Classic Dress Shoe Designed With A Tapered Toe Box For The Contemporary European Styling. Formal Business Shoes With Rubber Outsole And Cushioned Footbed For Comfort And Traction. The Brogue Shoes Featuring Cap Toe Design And 4-Eyelet Lace-Up Vamp. Occasions:Suitable For Wedding,Formal Dress,Party,Office And Casual Occasion.